Notes: Based on the manga by Kuroda Iou, which is simply referred to as "Nasu". The Vuelta a Espana is one of Europe's pro cycling Grand Tours. It's a punishing three week race, with a long trail that meanders across the mountains and plains of Spain before ending in the small town of Andalusia. For most cyclers, this is a key race to rack up points for the World Championships in October. For PaoPao Beer racer Pepe, it's also an unpleasant return home. What does it take for an anime to get a five star review? I've been writing reviews off and on for a couple of years now, and after twenty-some postings, I've only felt compelled give that rating once. And it wasn't because I've seen a lot of bad anime- quite the opposite, in fact. It's more like something that I can recommend without reservations is, by nature, very rare. And I think it's fair that when you give something your highest recommendation, that something has to be very special. It has to stand out from the pack. It should move you, or energize you, or challenge you, or change you. Now, by no means at all does it have to be perfect. But it has to stand out, it has to compel you to the point where giving it anything less would feel criminal. And the more anime I watch, and the more my knowledge of the history and techniques of animation and film deepens, the harder it is to impress me. Once you can start throwing around terms like mise en scene and rattle off the names and histories of favorite directors, you also pick up a bit of cynicism. And as I watch one series after another after another, realizing that many of the things that impressed about me are actually old hat, and see how cyclical and stereotypical many of the series I initially revered are, I get impatient. I want something that can give me that feeling of wonder again. And I found it in Nasu: Summer in Andalusia. In its short forty minutes, it moved me, challenged me, energized me, fascinated me, and excited me. I haven't felt compelled to write a review like this in a long time; this short OVA packs more emotion, ambiguity, and beauty in forty-five minutes than most series can do in thirteen episodes. Because the OVA is so short, though, I can't go into a lot of detail. I'm going to quickly hit some highlights for me, but leave the discovery of what makes Pepe and his story so compelling for the reader to discover. I don't care for sports, especially periphery ones like professional cycling. While I've admired the power of athletes like Lance Armstrong, I didn't understand what makes cycling compelling to watch. Isn't victory just a matter of endurance and candy colored spandex suits designed in labs? Unsurprisingly, though, professional cycling is more complicated than simply getting from point A to point B as quickly as possible. Cycling isn't even a one man show: there's a lot of teamwork, not only between team members to get one of their own across the finish line, but also between competitors, since the athletes move in a pack for most of the race. And strategy is everywhere: the size of the group, the weather, and the distance to the finish line all factor into the best time to break away from the pack, Most sports anime use gimmicks and a lot of imagination to make the sport look cool on the screen, which is fine, since it comes with the territory. But all Nasu needs is a close eye for detail and a love for its subject matter. Even better, that same complexity carries over to the characterization, especially with Pepe's messy relationship with his family, his hometown, and his teammates. This OVA and its sequel, Migratory Bird with Suitcase, is apparently a project of passion for its director, Kitaro Kousaka. The high quality of both the sharp direction and the script- which has some excellent, no nonsense dialogue where the characters often say more than they mean- shows that he is a director with talent to spare. 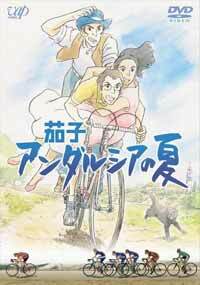 Though this is a Madhouse production, ANN shows that Kousaka has extensive experience working at Ghibli, including working as the assistant animation director in Ponyo on the Cliff by the Sea. If Ghibli is looking for fresh talent to replace the aging Miyazaki and Takahata, they might not need to look much further than this talented forty-seven year old. And even though the animation does get weak at times, it ends strong, which is when it matters the most. In short, Nasu has earned every star I can give, and if there were more, I'd add them. At the risk of repeating myself, this anime is special. It captures not only the intensity of cycling, but also the messy details of love, family, and the transition to adulthood. Recommended Audience: Nothing offensive, but it's best watched by college students and adults. This is one of those movies that you can only appreciate as you get older.